Pour oil into a large sauce pan (or you can use a fondue cooker) and heat to 350 degrees Fahrenheit. Beat eggs in a small bowl until frothy. Pour Panko into a large bowl or deep tupperware container. Combine flour, pepper, and Chachere’s seasoning. Dredge shrimp in flour mixture coating both sides evenly, and shake off the excess. Then dip in eggs (coating the entire shrimp) before tossing in panko. For best results, we like to use the tupperware container with a lid to do a little shake & bake – that way, all the shrimp get an equal coating of breadcrumbs. 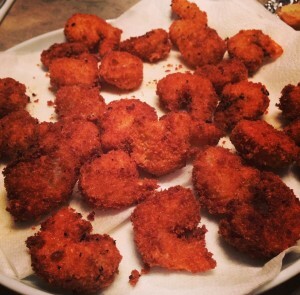 In batches of 10-12, fry shrimp in oil. Look for the nice golden brown color. Serve with cocktail sauce, or a bit of sriracha with ketchup. 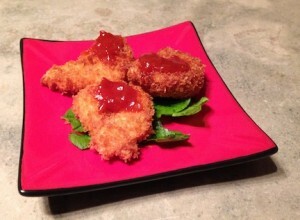 We like to think this traditional panko breaded shrimp recie has been “Southified”. That’s Southern + Fried = “Southified”. Try using that in a sentence this week, y’all!